Lissocarcinus orbicularis Dana 1852. Harlequin Crab. Variably marked, colored. Free-swimming, but usually found in association (in or on) sea cucumbers and anemones. To about half an inch in carapace diameter. Indo-Mid-Pacific; East Africa to Hawai'i. 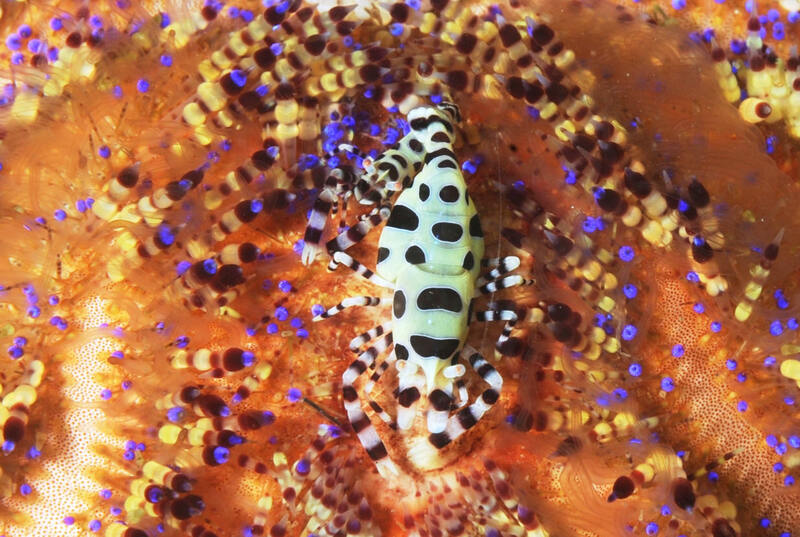 This one embedded on a sea cucumber in S. Leyte 2013. Lysiosquillina lisa Ahyong & Randall 2001. The Giant Mantis Shrimp. This species spends almost all its time at the very mouth of its burrow, evidently in wait for potential prey. Oblong shaped eyes may be of varying and changing color. Philippines and Indonesia. To about 20 cm. S. Leyte 2013. Periclimenes colemani Bruce 1975. Found usually paired on Toxopneustid Sea Urchins. S. Leyte 2013.